The neck is a tell-tale sign of youth. Yet, when it comes to maintaining our looks, we often pay little attention to the neck and hands. The face—even the décolletage— get all the sunscreen and care. But, for overall beauty, one can’t ignore the all-important neck. The neck’s shape and skin quality influence not only the face, but also the chest and shoulders. Think about it: A double chin or sagging jowls can rob a face of its angular, youthful shape. The “waddle” directly under and behind the chin can age an otherwise beautiful profile. And a leathery, pigmented neck might not match a well-cared for face. Fortunately, the neck is a canvas on which we can apply many different cosmetic solutions—from lunchtime quick fixes to surgical facelifts. What one needs to improve the neck often depends on many factors, including weight, genetics, age and sun exposure. The goals include: symmetry, or making the transition from face and neck seamless, as well as shape, which focuses on restoring or creating more acute, youthful angles to the neck and jawline. Creams and exercise may work to rejuvenate many things, but not the neck. The jowls are one of the first places we see the signs of aging. Fat that used to inhabit the upper portions of our faces often migrates to the jowls. The lumpiness that results can obscure a nice, straight jawline border. Our approach to fixing the problem is straightforward: we carefully remove the fallen fat with laser liposculpture, following the jawline and restoring a more youthful shape. A similar problem, the “waddle,” also responds well to laser liposculpture. Depending on how extensive the waddle is, we might sculpt from the chin to the clavicle (the area between the neck and shoulders). There is little if any downtime from laser liposculpture of the neck. We ask patients to wear an elastic chin strap for three days following the procedure, but they can get right back to being active, even as their wear the strap. A small chin is another problem, which usually leads to cascade of cosmetic issues. Women and men, alike, tend to seek more acute lines along the jaw and from chin to neck. 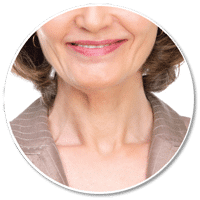 Addressing a small chin can make a huge difference, cosmetically. We do this in a variety of ways. For chins that require only slight enhancement, we might use synthetic fillers or autologous fat to build the chin. For chins that need a more robust change, we turn to silicone implants. These implants are popular because they’re soft and can be customized to fit any face shape or size. We can make even more precise adjustments to shape and size at the time of the procedure, with patients able to weigh in on the final look as the procedure is done under local anesthesia only. For people who have loose skin around the lower face and neck, we often recommend a more extensive face lift. Why surgery? There’s nothing like a facelift for skin tightening and neck contour. Still, there is a spectrum of facelift types. Some are less invasive and require little recovery; others are quite complex and require about a month of downtime. Candidates for the more invasive surgery include those with extensive skin laxity in the neck. The full procedure involves making an incision that goes from behind the ear, down the hairline and an incision under the chin. We tighten the platysmal band and re-drape the skin. In some cases, we combine the facelift with a chin implant. Generally, the more invasive the procedure, the more dramatic the results and the higher the risk for complications. 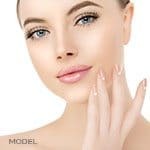 People who require extra precautions or might not be candidates for the facelift include smokers, because of problems healing, people on blood thinning medications and those with uncontrolled diseases such as cancer, cardiac and diabetes. One can’t treat the neck without looking at the skin’s quality. We look at the skin’s elasticity. Is it supple or crinkly? Is there a lot of sun damage, with brown spots, red spots? How is the texture and tone? Are there vertical bands or deep lines on the neck? Most people want to address any and all of those issues, and we can. The older we get, the more likely it is that vertical bands from the platysmal muscle in the neck will start to show. 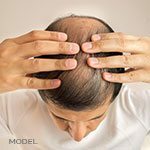 We address those successfully with neuromodulators, such as Dysport™ or Botox™. Neuromodulators works to relax the muscle and diminish the resulting bands. Another aging issue: horizontal neck folds. These respond nicely to fillers, such as Perlane™ or Juvéderm™. The fillers plump out the folds to make the neck smooth. Sun damage is a huge concern, especially around the neck. I see it often: People come into my office and have paid close attention to protecting their faces from the sun, but not their necks or hands. Even the treatment they seek tends to be centered on the face, until I explain to them that what goes on with the neck is reflected in the face. To restore skin texture, tone (including spottiness) and some tightness, we often turn to our gold standard Fraxel restore™ laser in combination with Thermage™. The dual approach is great for treating the face, neck and hands, for a seamless result. Patients love it because there’s virtually no downtime. The skin might be pink for a few hours, but makeup easily covers any temporary discoloration. There is one caveat to using the Fraxel™ or any laser during the summer months. Sun exposure and lasers do not mix. So, while the summer might be a great time to plan a fall or wintertime laser or Fraxel™ procedure, the actual treatment is best done when you’re able to stay out of the sun for weeks before and after the treatment. The summertime is a great time, as is anytime of the year, for all other neck rejuvenating procedures–from fillers and neuromodulators, to facelifts. For more information about cosmetic solutions to restore a youthful appearance please call 570-296-4000.